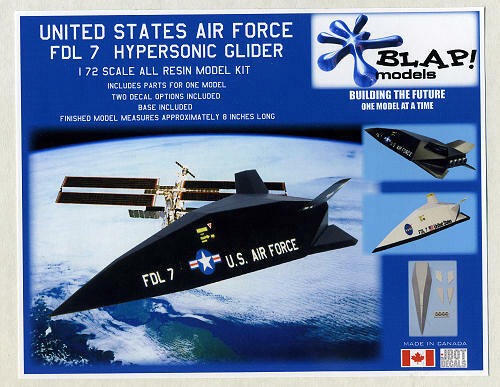 " The Model 176 began with the collaboration of McDonnell aircraft and the AFFDL in the late 1950s on hypersonic control issues. After a series of experimental and test flights with different configurations, the X tail and FDL-7C/D glider configuration emerged as the most stable over a wide Mach range and was capable of earth circumference glide range. In the early 1960s the various configurations had a windshield to allow the pilot to see outside. But with automatic flight capabilities, the windshield was eliminated. The FDL-7 was to be used in conjunction with the USAF Manned Orbiting Laboratory (MOL). The FLL-7 was a thoroughly tested configuration with a complete metal thermal protection system that was the same weight as the ceramics used for the Shuttle, but was sturdier. With the loss of the MOL program, the need for the FDL-7 disappeared." 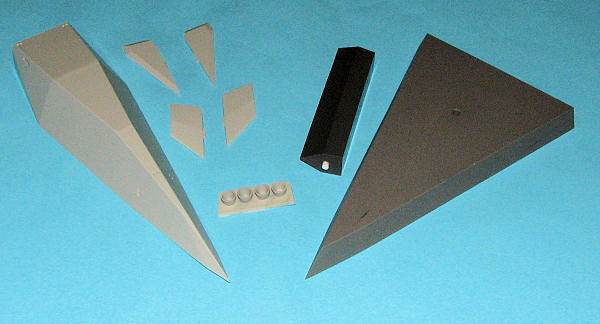 The kit is nearly identical to the Silver Dart model previously done by Blap. This is not surprising as the Silver Dart was based on this projects. There are some differences in that there are four large exhaust nozzles instead of the two large and four small ones provided on the Silver Dart. The recesses for the 2+4 arrangement is still present on the rear of the fuselage section, but that is not a problem as the new nozzles are a single piece and attach over it. The other major change is in the base. Blap has realized that the circular base with a brass rod may not be the strongest support (though I've had no problem with mine) and so has developed a base that is sturdier and better designed to match the kit. Blap's resin molding is world class with nary a sign of an air bubble, void or any other molding glitch. Small sections of pour stub attachment will need to be sanded off, but that is pretty well it. If like the previous kit, more time will be spent painting than in actual assembly. Decals are provided for by Jbot and are very nicely printed. These are probably ALPS printed as the instructions recommend careful handling to prevent damage and they are covered by a single carrier. There are markings for two aircraft. The USAF version can be done in black with white markings or silver with black markings. The other is a NASA version and is pure conjecture, but looks nice in its white with a black underside. There are two insignia options with the NASA option. These ALPS printed markings from Jbot should provide no problems with the black background as they are double printed with a white background to improve opacity. Now I have to say that I really like this sort of thing. It has the combination of cool looks and easy assembly that appeals to me. There has been some muttering on other news groups that this kit is not accurate for what it is trying to portray, but looking at the images provided as proof, I don't see much of anything that looks to be off. This is really great stuff. A superbly cast kit of an equally interesting subject. Not only that, but it won't take an age to build and is almost ready to assemble as it arrives. Can't beat that. If real space is an interest of yours, then this has to be on your list of things to get. Oh yes, I am always forgetting this, but for those wondering, the completed model is a bit over 6 inches long. Review kit courtesy of Blap Models .Order yours direct. If you would like your product reviewed fairly and quickly please contactme or see other details in the Note toContributors.